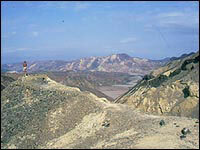 The badlands of Eritrea (Image courtesy Bob Walter). By five in the afternoon on a February day in 1999, the temperature is still 40 degrees Celsius. 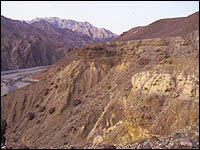 Canadian geologist Bob Walter is on the badlands of Eritrea in northeast Africa, one of the most remote and inhospitable deserts on the planet. It’s windy, dusty and dry, but if his suspicions are right, enduring the sweltering heat will be but a small sacrifice if he finds what he expects: fossil remains of our human ancestors. “From a geological point of view, I was able to look at satellite images and say, ‘this is an area that looks promising,'” says Walter, a professor at the University of Toronto, in an interview several months later. For the past 25 years, Walter has been studying the geology of East Africa in a quest to fill in some of the gaps of our human evolutionary tree. He uses maps and satellite images to figure out which sites may yield further clues to how humans evolved. 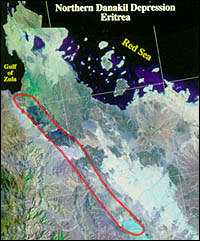 The highlighted area in this satellite image of Eritrea represents sedimentary rock formed within the last 3 million years. Image courtesy NASA. 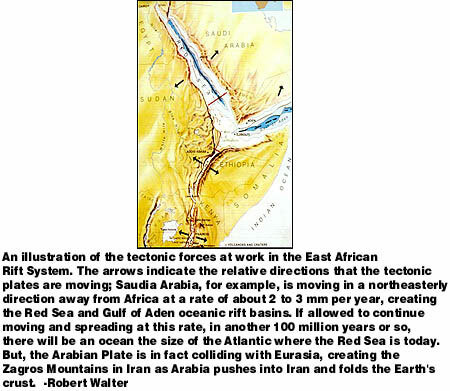 His analysis of satellite images of East Africa pointed him to several sites in Eritrea, where the volcanic and sedimentary rocks range in age from about six million to less than 100,000 years old. It’s the perfect time frame in which to look for hominid fossils; our two-legged walking ancestors and the great apes branched from a common ancestor between six and four million years ago. And the first time you might start recognizing us in the fossil record is about 100,000 years ago. 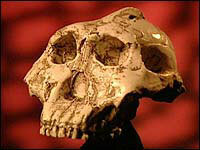 The most significant hominid fossils in the past 40 years have been found in or near the East African rift valley. CLICK to find out how the rift was formed. The tiny country of Eritrea also sits along an ancient, 2,000-kilometre-long rift valley, which runs north-south along eastern Africa. 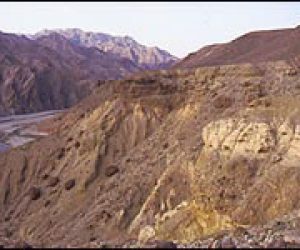 Created by tectonic plates forcing apart the Earth’s crust, this valley is where the most significant hominid fossils in the past 40 years have been found. “East Africa holds the key to the study of human evolution,” says Walter. As early as 1871, Africa was thought to be the cradle of humankind. In his book, The Descent of Man, Charles Darwin wrote that Africa was probably where humans evolved, largely because our closest living relatives – gorillas and chimpanzees – all live in Africa today. The idea however, wasn’t well received. “Anthropologists disliked Darwin’s suggestion intensely, not least because tropical Africa was regarded with colonial disdain: the Dark Continent was not viewed as a fit place for the origin of so noble a creature as Homo sapien,” writes paleontologist Richard Leakey, whose famous parents found a wealth of fossils in East Africa and established the area as a vital part of human history. Asia was where most people thought that our early human ancestors and great apes branched from a common ancestor. In fact, the first hominid fossil hunter, a Dutch anatomist named Eugene Dubois went searching for fossils in Indonesia because another close relative, the orangutans, lived there. He was rewarded in 1891 with the discovery of Java Man. It was the first hominid fossil found outside of Europe. At the time, the only known hominid fossils were of Neandertals from Europe, which come from a relatively late stage in human evolution. 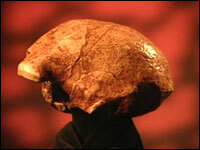 Peking Man (left); Taung Baby (right). Then, in 1927, Canadian Davidson Black discovered what became known as Peking Man, a hominid uncovered in an abandoned limestone quarry near Beijing, China. At about the same time – 50 years after Darwin’s hypothesis – came the proof. Raymond Dart, an Australian anatomist discovered Taung Baby, the first African hominid, in a limestone quarry in South Africa. But it wasn’t until the late 1950s and 60s, that people came to accept that Africa was where human evolution began. In 1959, Mary and Louis Leakey discovered Zinjanthropus, a hominid skull at Olduvai Gorge in Tanzania. Tools had been found there 30 years earlier, and finally the possible toolmaker was revealed. (The Leakeys also discovered Homo habilis there years later. The jury is still out on who made the tools). 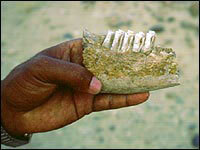 Since that discovery, thousands of hominid fossils have been uncovered in East Africa. With the advent of radiometric dating techniques, which allowed scientists to accurately date the fossils, Africa finally became widely accepted as the birthplace of our human ancestors. The rift valley in East Africa provides the perfect environment to preserve animal bones. Almost 100 per cent of the time, if an animal dies, its bones will disappear completely. First other animals scavenge the body. Then, the sun’s hot rays help the remaining flesh rot away, and disintegrate the bones to powder until there’s no record of the animal. As Bob Walter, a geologist at the University of Toronto, explains, very specific conditions have to be in place before a bone can become a fossil. 1. Die near a riverbed. The animal must die near an ancient river or lake bed that’s undergoing active sedimentation. That means the mud and sand in the river or lake are accumulating rapidly. If an animal dies in or around the environment, its bones get covered up by the sediment very quickly. This prevents two things: the bones getting chewed up by other animals, and the bones eroding over time. 2. Be exposed to the right kind of water. Not every bone that gets buried becomes a fossil. Sometimes they simply rot away. But for those that don’t, it’s all due to specific conditions in the sediment. Scientists don’t know what those conditions are exactly, but it has to do with “the right kind of water percolating through the sediment, and probably a series of wetting and drying cycles,” explains Walter. 3. Change organic molecules into inorganic ones. Animal bone is mostly made up of inorganic material, mainly calcium phosphate. But about 10 per cent of it is organic – carbon molecules with life-performing functions. These organic molecules easily break apart after death and are replaced with inorganic elements such as calcium, silica and magnesium. This process actually changes the bone into a stone without changing its shape. And voila! A fossil. 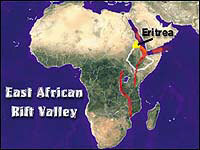 Eritrea, however, remained unexplored territory. Walter had wanted to explore the sites since he first saw the satellite images over 10 years ago, but a bloody war in the area prevented him or anyone else from studying the area. Eritrea was in a state of rebellion against Ethiopia, until it formed its own country in 1993. So, it wasn’t until last year, after two years of preliminary field work in the newly formed country that Walter was able to start exploring for hominid fossils. When Walter and his team arrived at the first site, an area called Dandero, about 50 kilometres inland from the Red Sea, he came across a geologist’s dream. It was a sequence of sedimentary rock eroded by rainstorms over the years to expose its hidden treasures. And he didn’t have to wait long to find them. Embedded in the rock, as well as scattered on the ground, lay thousands of hand axes.